Lucidchart launched in 2010 as one of the very first and most impressive graphical applications on the web. Over the course of several years, it has grown organically to include an incredible array of features. However, for many users it has become unwieldy over time, and its complexity can sometimes get in the way of its core value: drawing diagrams more quickly and easily. We wanted to be able to thoroughly test our view code as part of our continuous integration system. We wanted to keep our styling consistent within and among our applications by tying CSS very closely to DOM specification for reusable components. We wanted a framework that would play well with the Google Closure Compiler’s advanced optimizations, which we use extensively. We didn’t want to deal with Angular 1’s performance bottlenecks or strange magical syntax. (valuePreview) = "lineWidthPreview = $event"
There’s no single function call that’s taking up all your time. Instead, it’s thousands upon thousands of calls inside AbstractChangeDetector. Each is nearly instantaneous, but in aggregate they are crushingly slow. But almost nothing is changing! Have less DOM. This is a critically important piece of the puzzle. If DOM elements aren’t visible, you should remove them from the DOM by using *ngIf instead of simply hiding elements with CSS. As the saying goes, the fastest code is code that is not run—and the fastest DOM is DOM that doesn’t exist. Make your expressions faster. Move complex calculations into the ngDoCheck lifecycle hook, and refer to the calculated value in your view. Cache results to complex calculations as long as possible. Use the OnPush change detection strategy to tell Angular 2 there have been no changes. This lets you skip the entire change detection step on most of your application most of the time. By default, the change detection strategy on any component or directive is CheckAlways. There is another strategy, OnPush, which can be much more efficient if you build your application carefully. If you’re able to use OnPush throughout your application, you will ideally only ever run the change detector on components that have actually changed (and their direct ancestors). This reduces the time complexity of the change detector from O(n) to O(log n) in the number of component instances in your application. There are two ways to prepare a component or directive for OnPush: Using immutable inputs, or using observable inputs. When you use OnPush, the change detector will run whenever an input property changes. However, if you pass an object or array as an input to a component (which is very common), the change detector will not notice if something in that object or array changes. It only detects when you change to a different object entirely. The simplest way to make OnPush work perfectly is to use immutable objects throughout a component. If you change an object you are passing to a component, don’t change its properties in place; rather, construct a copy with the change applied. That way Angular 2 can see you’ve changed an input and adjust your DOM accordingly. If you can reliably listen for when your data changes, then you can manage when the change detector runs yourself. It doesn’t matter if you’re using something like RxJS’s Observables, or if you roll your own change management system, as long as you are notified every time your data changes. When the component is constructed, we inject our observable user, a change detector, and the zone. Whenever changes happen on our user, we mark the change detector as needing to be checked within the Angular 2 zone. It’s important to do this if your change callback can come from outside the Angular 2 zone, which does happen regularly in our application. Here, we have to watch for changes with the ngOnChanges lifecycle hook, and unbind and rebind changes appropriately. Now, I don’t want to recommend that you roll your own change event or observable system. But these examples hopefully make it clear that you don’t have to use any particular library in order to take advantage of Angular 2’s OnPush change detection strategy. If a component is not marked for change detection, none of its descendant components are checked either. So if you use the OnPush strategy on a component which consists of CheckAlways components, those CheckAlways components will never actually be checked for changes. This can bite you in subtle ways. For example, you may check that each child component each is using OnPush, but forget that you’re using a Directive that does not. Getting this right is not complex, but it does require complete thoroughness. 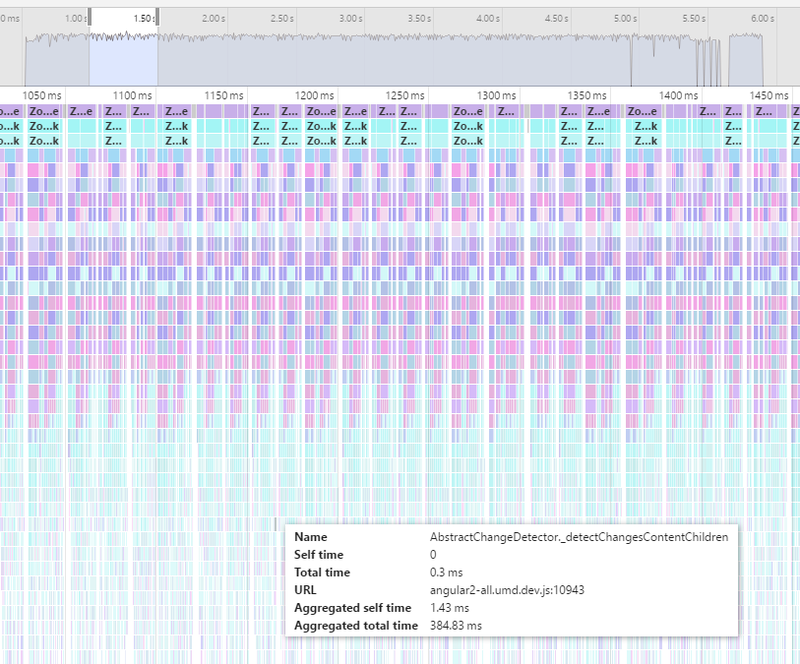 As you work to make your applications faster, using Angular 2 or otherwise, always use profiling tools to decide where to optimize. If your profiler output is dominated by a function that is rarely called but operates too slowly, optimizing the change detector won’t help much. If your profiler output looks like ours did (in the image earlier in this post), use the “Heavy (Bottom-Up)” view and sort by total time. Then scan down the list until you find the first few methods from your application. Make them faster. And when they’re pretty fast, but still taking up too much time, that’s when you want to improve your change detector patterns. What was the reasoning to not use TypeScript? The code that you have to write looks a lot more verbose, and to someone who is used to Angular2 in TypeScript it looks pretty confusing, than it would if you had used TypeScript. There must be a strong reason not to use TypeScript? I’m curious why you said to move complex calculations into the doCheck lifecycle hook. The ngDoCheck method is called every time a potential change occurs. If you put a complex calculation in there it will be firing off A LOT. doCheck fires relatively rarely if you use OnPush everywhere. The primary point here was to move any calculations out of the template, but ensure that they’re re-run to see if they’ve changed whenever a change detector pass is pushed. Having calculations on the template itself is the worst of all worlds: code maintenance is worse, runtime performance is worse, etc. We faced same problem on our Angular 6 web app. We had used lots of function call on html. Because of the function calls, we had freeze problem on browser. We had to remove all the function calls from html. What the weard thing is that angular does call the functions even I move the mouse over page!